Using blenders to make hot soups and hot drinks can be a simple task, but not all blenders can do it. There are some things to consider when deciding on the best blender for hot liquids. Let cover the basics and then review what we feel are the top blender choices. Why Should Your Hot Liquids Blender Have a Vent? 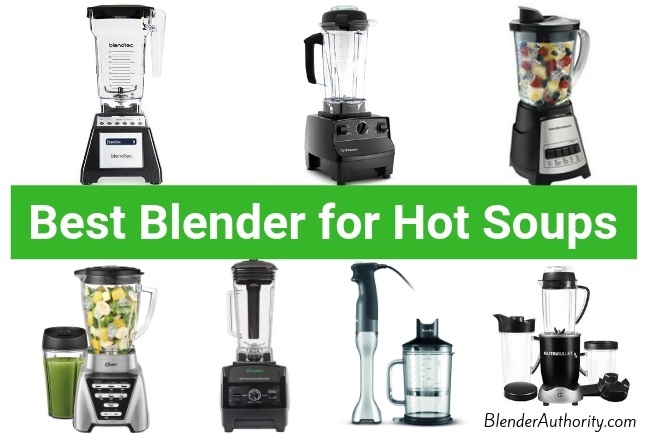 Every blender brand has different criteria when it comes to blending hot ingredients as some are not rated to safely handle hot temperatures. Certain blender manufacturers only allow room temperature liquids so make sure to reference the manufacturer’s manual to see if they have a temperature rating limit. Most brand name blenders now use high impact BPA-Free plastic which can withstand heat. Otherwise there are a limited number of blender models that use glass jars which generally work fine with warm liquids. Some blenders have enough horsepower to create hot soups from cold ingredients through heat friction. It is important to distinguish between needing a blender for hot coffee drinks and a blender for making hot soups. Blade design can effect the blending consistency and determine whether or not you can can make hot recipes from cold liquids. Blades that draw the ingredients down to the bottom to create a “Vortex” are best because they cause even blending and will create friction for heating up the ingredients. Some blender blade designs like Ninja’s Total Crushing blade(tall stacked multi-blade) don’t perform as well at blending soups and won’t heat up the ingredients. Finally, make sure the blender is designed with a vented lid to release pressure from steam. DON’T use upside down “bullet blenders” with hot liquids. Below is a ranking of our top blender model choices. We arranged them in order of price from most expensive to least. While you can make hot soups with any Vitamix blender, we continue to like the classic Vitamix 5200 that ranks at the top of many blender tests with its proven design. Positives: Top rated by testers and consumers as it is simple to use and blends anything with ease. Industry leading warranty and built to last a LONG time. Powerful enough to make any hot soup you can imagine using cold, raw ingredients. Simple controls and versatile container design allow you to make small or large portions so you don’t have to buy additional Vitamix containers. Negatives: Louder than newer Vitamix models. More expensive than standard blenders. Doesn’t fit under upper kitchen cabinet with its tall container. Overall Opinion: Vitamix is a workhorse of a blender widely used by professional chefs. It is hard to match Vitamix’s blending performance especially when it comes to pureeing cold raw ingredients into a hot soup from friction. Once you start using a high performance blender like a Vitamix, you realize how many other recipes you can make with very little food prep work. See pricing for a NEW 5200 or Factory Refurbished 5200. Other Vitamix soup making models to consider if you want more features: 750 which is quieter and has a programmed “soup” setting or the newer Ascent A3500 if you want the latest design with “Smart-detect” jars. Keep in mind that both the 750 and A3500 use newer Vitamix “wide” jars which don’t blend small batches. It is quite simple to make hot soups with a Vitamix. Just add raw ingredients and slowly turn the variable speed dial up to high(or 10). You can also pulse at the beginning to move the ingredients around. Blend for around 5 minutes or until desired temperature. You will see steam coming out of the lid when it is hot. USER TIP – You can reduce blending time by starting with hot water. The Blendtec Total Classic Original Blender with FourSide Jar is an excellent countertop model priced less than the Vitamix. It can easily prepare hot drinks like Keto coffee, bulletproof coffee, and hot chocolate. It also can crush ice, mix batters, prepare smoothies, and puree hot soups. Similar design to their professional blender models. Positives: Professional quality blender that can blend anything with plenty of power. Can make hot soup from cold ingredients. Easy to use controls with a clean modern design. Negatives: More expensive than typical blenders. Doesn’t use a tamper which is nice to have for thick recipes. Overall Opinion: Blendtec is made in the USA and its blenders are known for their quality and power. This is the classic Blendtec model which is more affordably priced. Also, this model comes with the Fourside Jar which is better suited for making soups compared to Blendtec’s larger WildSide Jar. 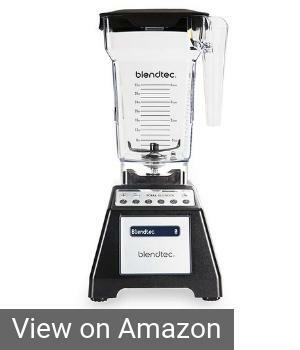 This specific Blendtec blender is a very good price for its power and excellent warranty. It is a close 2nd choice for us as we have a slight preference for Vitamix’s design, reliability, and versatility. Blendtec has a pre-programmed Soup cycle that will automatically bring the blender to it’s highest speed. At high speed it will pulverize the ingredients and heat the soup from friction. The Soup cycle runs for 90 seconds which means you will have to run the Soup cycle more than once depending on the ingredients used and how large of a batch you are blending. Just push the Soup button again and check the liquid temperature once the cycle is done. It typically will take about 3-4 minutes for a Blendtec to create hot soups from cold/room temperature liquids. We have written about the Cleanblend blender before as it is one of the few blenders that offers similar power and performance as a Vitamix for a lower price. 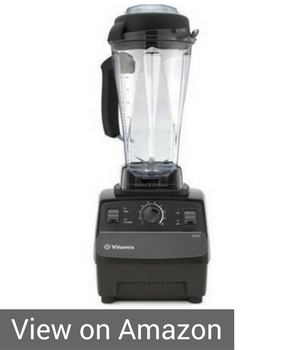 It looks like a replica of a Vitamix 5200 with similar features and controls. Positives: Plenty of power and great price. Performed well in comparison tests and has strong user reviews. 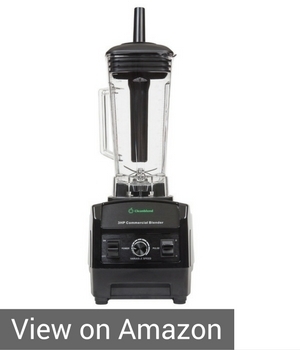 Decent 5 year warranty for this blender price range. Can puree anything and is great for making soups. Negatives: Takes longer to turn cold ingredients into hot liquids compared to Vitamix and Blendtec. It is loud. Overall Opinion: The Cleanblend is a more economical choice if you can’t afford a Vitamix. The only real negative is that Cleanblend is a newer company and doesn’t have the long-standing brand quality reputation of Vitamix. Oster has been making affordable, mainstream blenders for a long time and their Oster Pro 1200 offers great performance for a reasonable price. It has 1200 watts of blending power and 7 speeds (including 3 preset programs). Positives: A best seller for this price range with strong reviews. Nice features like Boroclass glass jar and all-metal gear drive. Can be integrated with its food processor for more capability. It can easily blend drinks, crush ice, smoothies, and milkshakes. Negatives: Doesn’t offer the same blending power as our above choices. It won’t make hot soup from cold ingredients and it will struggle with thick recipes. It doesn’t have a tamper. 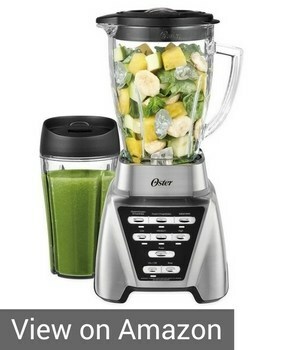 Overall Opinion: A good blender for the price with nice features and build quality. Frequently competes against Ninja blender in this price range but the Oster’s blade design works better for blending soups than the Ninja blade. Good for pureeing pre-cooked ingredients into a soup. Oster’s instructions for this blender when you work with hot liquids is to remove the filler cap and start at a low speed, and then gradually increase to a faster speed. Do not add liquid over the 4 cup (1L) level. Always keep hands away from steam. Hamilton Beach is another well known appliance brand. They have made blenders for a very long time. The Hamilton Beach Power Elite is one of our favorite cheap blenders. Positives: This blender is simple to operate with push button controls and no electric programs. Features a thermal glass jar and 3 year warranty. Negatives: Limited in blending performance as it is not intended to blend thick recipes, hard ingredients, or fibrous smoothies. Overall Opinion: A great blender for simple blending tasks and could easily blend hot drinks or soft ingredient soups. Very few blenders in this price range offer a glass jar which is a nice bonus to have with hot liquids. 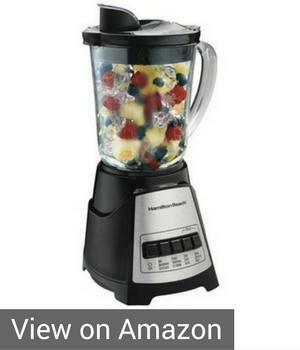 Overall there isn’t much to analyze about this blender. It is basic but works fine if you blend with enough liquid. When blending hot liquids, open the lid’s vent opening and close any pour spout openings. If pouring with lid in place then ensure the hinged cap is securely in place. Hot liquids may push lid off of jar during blending. Do not fill blender jar beyond the 3-cup (710-ml) level in order to prevent burns. With the protection of an oven mitt or thick towel, place one hand on top of lid. Keep exposed skin away from lid. Start blending at lowest speed. Nutribullet Rx : The Nutribullet Rx falls in the middle price range of the above blenders and is a large-size personal blender with a built-in soup heating function. Most personal blenders use a sealed jar which prevents you from blending hot liquids, but the Rx offers a separate jar with vented lid. It has a lot of power for the size and can puree most ingredients into a soup-like consistency. Just push the “G” button on the front for 2 seconds to activate a 7 minute heating cycle which will heat up the ingredients with its built in heater. It is a good option if you just want a small-size blender. What about an Immersion Blender for hot liquids? Immersion blenders or “Handheld Blenders” are simple to use and great for whipping and frothing a hot drink. They can make simple soups right in the pan or bowl that you already have the hot ingredients in but struggle at blending raw ingredient soups. An immersion blender should have a shaft that’s long enough to reach the bottom of the pot for a consistent texture. Kitchen Aid Immersion Blender : The KitchenAid KHB2351CU 3-Speed Hand Blender is an immersion blender that can be used to to prepare any coffee drink in your own mug, mix soups in a pot, and is great for frothing milk. It’s affordable and has a comfortable non-slip handle for more control. Stainless steel blade is great for hot liquids. Breville Immersion blender : The Breville BSB510XL Control Grip helps you puree and blend soups in the pot thanks to its 280-Watt motor. It has an 8-inch shaft that will reach the bottom of your bowl. Most countertop blenders have enough horsepower to make your favorite hot drink as there are no difficult ingredients that need to be pureed. Countertop and immersion blenders can be used to blend coffee, hot chocolate, applesauce, and other hot blends but you should make sure that they’re made of heat-resistant materials. If you’re using a countertop model, make sure that it has a secure lid to protect the kitchen counter from splashes and that it has a venting lid to allow steam to escape. When you’re preparing puree raw ingredient soups, you need a powerful blender that can blend long to chop veggies and leave you with a creamy and frothy soup. Our top 3 blender choices above have the horsepower to blend raw soups compared to most blender motors that overheat after blending for too long at high speeds. You can use a weaker blender by precooking the ingredients and then adding them to the blender to puree. Countertop models can be messier to use than handheld blenders because you need to pour the hot liquid into the container. A stick(immersion) blender is used to blend soup in the pot and is perfect for mixing a large amount of cooked soup or stew. The hot liquid will heat the air and push the lid up or even crack the container. If you’re not careful, this can cause severe burns, in addition to lots of splashing. Make sure that there is a vent or an opening in the lid to let the hot air out, without splashing the liquid all over the kitchen counter. If you don’t have this opening, remove the lid after a couple of minutes to release the pressure. For an immersion blender, this won’t be an issue. If you have read this far then you have a good understanding of how to properly blend hot liquids and how various blenders handle making hot soups. All of the blenders above are great choices. If you have any questions please leave a comment below. Veggie Bullet Review – Is it Worth It ? Nutribullet vs Magic Bullet Test – What is the best bullet blender ?